It’s time to start working on one of our favourite events of the year…as we open up nominations for our 2017 Animal Action Awards! Every year at a prestigious ceremony at the House of Lords, IFAW honours the achievements of outstanding individuals who have made a significant contribution to animal welfare. You can nominate your award-worthy animal heroes here. The event is hosted in the company of Lords, Ladies, MPs, celebrities and other VIP guests as well as animal loving friends and colleagues. IFAW UK staff involved in the awards love reading through all the nominations as it gives us a real lift to reflect on how many amazing people across the UK are dedicating their lives to helping animals; day in, day out. The awards give us an opportunity to share with the wider public some of these success stories and hopefully motivate others to do something for animals in our daily lives. The awards are all about celebrating commitment to animal welfare and recognising true animal heroes – but as always, we can’t do this without you! 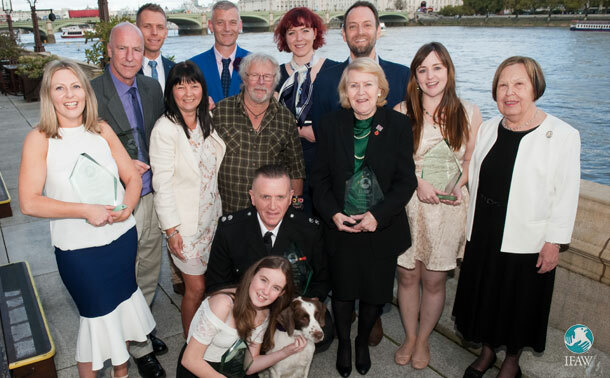 Last October we honoured the achievements of 10 award winners for their outstanding work to help animals and people. Baroness Gale, a long-standing friend to IFAW, kindly hosted the ceremony once again, and we enjoyed a typically entertaining speech and presentation from naturalist and broadcaster Bill Oddie, which has become a staple of the event. Our 2016 winners included Glasgow vet Ruby Shorrock, who runs free community clinics treating the dogs of homeless people, Sheffield schoolgirl Storm Burgess, who has raised more than £6,000 for animal causes and Dan Sidley, who set up the Yorkshire Swan Rescue Hospital to rescue, rehabilitate and release sick or injured swans. As the awards are all about animals, we can’t just focus on the humans! So, we also need your help to find a very special animal winner. Last year we were proud to honour 12-year-old springer spaniel Roscoe, whose keen sense of smell has helped London Fire Brigade investigators sniff out the cause of hundreds of suspicious fires around the Capital and beyond. Once again we’re looking for animals that have done, or do every day, something really special for their human friends - animals that have helped, supported or have changed the lives of their owners, carers or the wider community. Now it’s over to you! If you know someone whose work with animals deserves recognition then we need you to tell us! We would like to hear from you about any person or animal in the UK who you think deserves one of our 2017 Animal Action Awards, which are once again kindly being supported by the Express newspaper. It could be someone who runs a rescue centre or a wildlife sanctuary, a volunteer who gives up their time to help animals or teach children all about them, a young fundraiser, a campaigner on animal or conservation issues, or a pet or working animal who has made a remarkable difference to someone's life. The 2017 Animal Action Awards will be presented in October. Please ensure that you get your nomination in to us by May 30 at the latest. Please help us find this year’s winners and send us your nomination via the online form. It won’t take long, but it could make all the difference as we work to highlight more unsung animal heroes and inspire the next generation. Thank you so much for helping us recognise these animal heroes!